The image is a mock up of the interface for the digital version of Kards. This is just the first version and it will most likely change but trying to fit everything on the screen is a task in itself and this mock up does contain most of the important elements that I can think of. Will have to see how well it works when it gets implemented. Anyways, the main thing is that coding has started :) The shuffled deck is constructed. 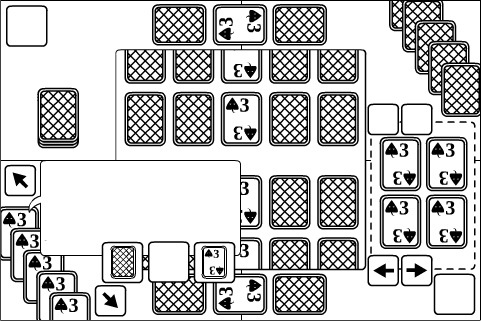 Both players are dealt 5 cards from the deck, a player is selected at random to start first, and the player who gets the first turn draws a card. This is all just code and nothing is visual yet but it’s a good start. What’s next: more coding and thinking more about the interface.